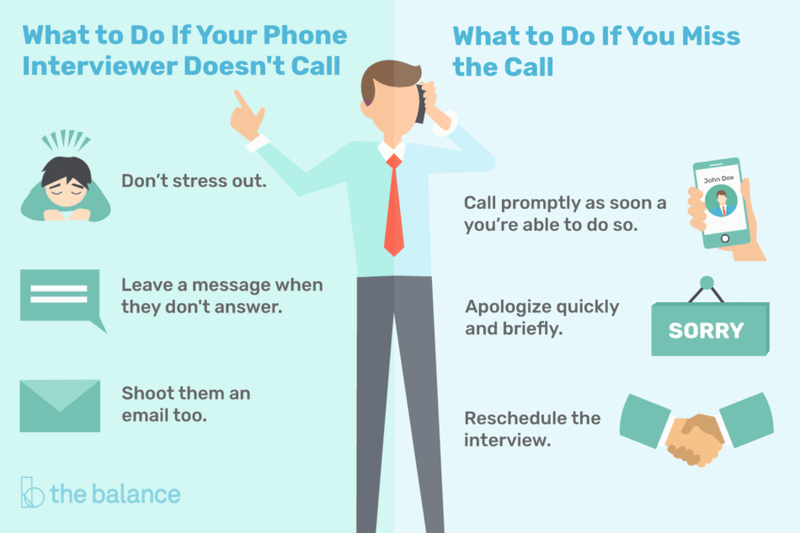 So, you’ve properly prepared for your phone interview, and your contact doesn’t call — now what? It’s a frustrating situation, but not an uncommon one. It can happen even when the hiring manager is very interested in interviewing you and everyone’s intentions are good. Don’t stress out. If your interviewer misses your call, it’s most likely not a reflection of you as a candidate. He or she could be caught up in a meeting or on another line, so don’t think that the miscommunication will negatively impact your probability of getting the job. Take a deep breath and move on to the next tip. Double-check the number to make sure you dialed it correctly. If you called the right number and no one answered, the blame’s not on you if you can’t get in touch. If you didn't call the correct number, don't panic. Start over and try again. If you're a few minutes late, apologize for the delay. If possible, leave a message when they don't answer. State your name, the reason you’re calling (for the interview) and the current time, as well as your contact information and how long you’ll be available to wait for the interviewer to get back to you. I am just emailing you in regard to our phone interview scheduled for today at _____ o’ clock. I called you twice but wasn’t able to get in touch. I will be available for another 30 minutes and hope to hear from you by then. If not, I am happy to reschedule at your convenience. Thanks again for the opportunity to interview. How Long Should You Wait for a Call Back? Your time is valuable, so, you shouldn’t feel obligated to sit by the phone and wait all day for a callback. Wait at least 15 minutes before giving up, but you shouldn’t feel the need to stick around for more than half an hour. Be patient and polite when deciding to reschedule. Although it’s annoying to have to reschedule an interview, something may have come up that was outside your interviewer’s control. Even if it was truly his or her fault, which you don’t have any way of knowing, and it’s still important to be kind and respectful when re-scheduling. If you’re irritated, don’t show it. Instead, be as flexible as possible when figuring out a new time to talk. I just wanted to confirm our phone interview in one hour. I’m looking forward to speaking with you. Thanks again. What happens if you decide to reschedule, and they don’t answer all over again? Unfortunately, this can happen on occasion, and it can be an extremely frustrating situation. As a solution, see if your interviewer will agree to call you so it’s on them to get in touch. As always, when you do get in touch and your phone interview is finished, send your interviewer an email thank-you note expressing your gratitude for the opportunity to talk and for their flexibility in scheduling the appointment. Call promptly as soon as you’re able to do so. Give yourself a moment to calm down and to assemble everything you need–the job description, your resume, and portfolio, your notes and calendar. Then call back right away. Apologize quickly–and briefly. Be accountable, and apologetic, but don’t belabor the point. Beating yourself up won’t make a good first impression. Remove any obstacles that might prevent you from making the most of the second chance. For example, if your call dropped, make sure you’re in an area that has better reception, or use a landline if you have access to one. If traffic held you up, plan your next conversation for a time when you’ll definitely be at your desk. Most importantly, don’t beat yourself up. A lot of things can go wrong when two people try to connect for a phone interview. Technology might fail you, or meetings could run late. Most people understand that life is full of speed bumps and will give a conscientious and responsible candidate another chance.